In mainland Europe, our source for many a savvy design tip and trend, homeowners often take their kitchen cabinetry with them when they move. More and more often, they are taking their kitchen floors as well. Snap-together laminate, a removable, portable flooring, has interlocking edges (photo below) that join the pieces together into a single unit. Like engineered woods, laminates are multiply sandwiches. The visible layer is a photographic image topped with a tough, clear layer of melamine that takes the wear. Products range from 9⁄32 in. to 1⁄2 in. thick. Laminate should be installed over a flat subfloor, which can be either a layer of plywood or even an existing vinyl or tile floor, as long as it is in sound condition. Laminate flooring is a rising star. It has loads of positive features and few minuses. In just five years, it has captured 4% of the entire flooring industry. As interest and demand grow, so too do the number and quality of products. Most laminate floors mimic wood or tile. But other patterns and textures are emerging. ABET Laminate, which produces the ParqColor series of wood pattern laminates (45 choices), also makes Fiber Floor, a textured product with a matte finish. Available in 12 muted shades, the slightly rough surface results from the burlap-bag fibers used in its manufacture. The sacks previously held coffee beans, so there are some bean bits in the flooring, which add flecks of darker colour. Seems perfect for the kitchen floor. Installations in the North American market used to require that planks be glued together. Now 20% of the laminate-flooring products in this market are glueless: They snap together with clever locking mechanisms tight enough to keep out liquids. These products, more than those requiring glue, target the do-it-yourself market. Even systems requiring glue use it only to adhere one tongue-and-groove plank to another, never to the subfloor. A laminate kitchen floor is meant to float atop the subfloor, not be glued or nailed to it. Some manufacturers produce several quality levels. Get the best you can for your kitchen. 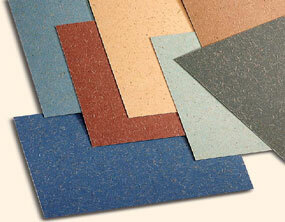 edges of most laminate floors require a bead of glue to join them. Newer styles, however, feature interlocking tongues and grooves that snap together. 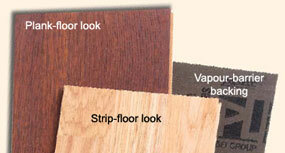 in laminate floors are the look of planks and strips. A layer of high-pressure laminate on the back of a flooring plank acts as a vapour barrier to reduce moisture absorption.